Safeguarding the wellbeing of our mental health workforce has become increasingly important. Demands on health services have increased and resources continue to be stretched. The empirical research to date has developed an understanding of the causes of burnout from an individual and organisational perspective. 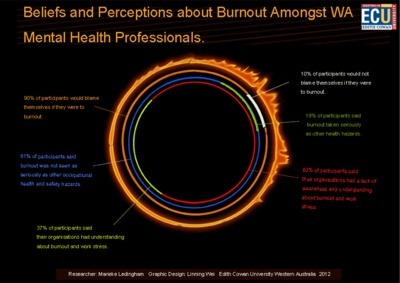 However little is known about how professionals think about burnout and the influence of their perceptions and beliefs on preventive behaviours. Findings suggest that perceptions about management’s ability to help, stigma, self-blame and the silence surrounding burnout all impact upon the professionals' propensity to actively avoid or seek help for burnout. The health and safety culture of organisations, mental health stigma, and risk perceptions are discussed in the visual representation of my findings which will be used in both the thesis and journal article for publication.